Library image #2317: Spring snow and limber pine north of Meeker Peak. The United States Congress designated the Worthington Mountains Wilderness (map) in 2004 and it now has a total of 30,594 acres. All of this wilderness is located in Nevada and is managed by the Bureau of Land Management. Worthington Mountain rises like a ship, 4,000 rugged feet above dry valleys of central Nevada to almost 9,000 feet. The extremely severe limestone backbone of the mountain presents a difficult challenge to visitors with heavily dissected, maze-like canyons, precipitous cliffs, knifelike limestone surfaces, and no surface water. Those who persist will be rewarded by endless vistas, natural arches, ancient forest (the oldest tree dated at 2,100 years), and limestone caves, the largest being Leviathan. Wildlife species inhabiting this Wilderness area include mountain lions, bobcats, deer, desert bighorn sheep, kit foxes, coyotes and raptors, as well as smaller common mammal and reptile species. 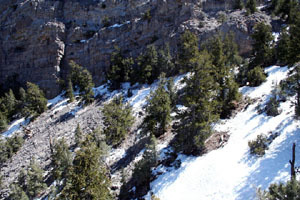 Forest cover in the mountains vary from sparse to dense stands of juniper and pinyon pine at lower elevations while ponderosa, limber and bristlecone pines cling to the jagged peaks. The Worthington Mountains feature a divergent flora from the curious combination Great Basin/Sonoran desert including cholla and cactus of the valley through pinyon - juniper, Limber and Ponderosa Pine, to the Bristlecone Pine of the craggy 9,000 foot summit ridge. Worthington Mountains wonderfully expresses the Wilderness characteristics of stark beauty, chaotic topography, and remoteness of Nevada wildlands. Planning to Visit the Worthington Mountains Wilderness? How to follow the seven standard Leave No Trace principles differs in different parts of the country (desert vs. Rocky Mountains). Click on any of the principles listed below to learn more about how they apply in the Worthington Mountains Wilderness.